Of all the parts on your average desktop 3D printer, the nozzle itself is arguably where the real magic happens. Above the nozzle, plastic is being heated to the precise temperature required to get it flowing smoothly. Immediately below the nozzle there’s a fan blowing to get the plastic cooled back down again. This carefully balanced arrangement of heating and cooling is the secret that makes high quality fused deposition modeling (FDM) printing possible. But as it turns out, getting the plastic hot ends up being easier than cooling it back down again. The harsh reality is that most of the fans small enough to hang on the side of a 3D printer nozzle are pretty weak. They lack the power to push the volume of air necessary to get the plastic cooled down fast enough. But with his latest project, [Mark Rehorst] hopes to change that. Rather than using some anemic little fan that would be better suited blowing on the heatsink of a Raspberry Pi, he’s using a hacked CPAP machine to deliver some serious airflow. The brilliance of using a CPAP machine for this hack is two-fold. For one, the machine uses a powerful centrifugal fan rather than the wimpy axial “muffin” fans we usually see on 3D printers. Second, the CPAP pushes air down a lightweight and flexible hose, which means the device itself doesn’t have to be physically mounted to the printer head. All you need is manifold around the printer’s nozzle that connects up to the CPAP hose. This “remote” fan setup means the print head is lighter, which translates (potentially) into higher speed and acceleration. [Mark] was able to connect the fan MOSFET on his printer’s SmoothieBoard controller up to the brushless motor driver from the CPAP motor, which lets the printer control this monster new fan. As far as the software is concerned, nothing has changed. He hasn’t come up with a manifold design that’s really optimized yet, but initial tests look promising. But even without a highly optimized outlet for the air, this setup is already superior to the traditional part cooler designs since it’s got more power and gets the fan motor off of the print head. Getting your 3D printed parts to cool down is serious business, and it’s only going to get harder as printers get faster. We wouldn’t be surprised if fan setups like this start becoming more common on higher-end printers. This year at Maker Faire, laser cutters were all the rage. Dremel announced a 40W laser cutter, but it won’t be available for purchase until this time next year, there is no price yet, and therefore doesn’t deserve further mention. Glowforge was out in full force, but the most interesting aspect of the Glowforge — a compact filter system that sits right underneath the laser — was not to be found. It looks like lasers are the next 3D printer. Of course, those in the know have already been using laser cutters for years, and there are options for desktop CO2 laser cutters that cost less than a kilobuck. I speak, of course, of the ubiquitous K40 laser, a machine you can get off of eBay or AliExpress for the price of a generic, off-brand 3D printer. There is a downside to the K40, though: the control electronics and software are notoriously terrible. Fix that, though, and you have something really spectacular. This year at Maker Faire, [Ray Kholodovsky] of Cohesion3D brought out his Smoothie-derived control boards for CNC machines and laser cutters. Of note is his K40 upgrade that turns the eBay special laser cutter into a 32-bit professional machine. This is the cheapest way to start lasing in your workshop. We saw [Ray] at the Faire last year when he was demoing his Smoothie-derived boards for 3D printers and CNC machines. These are tiny, relatively low-cost boards that use Smoothieware, an Open Source, 32-bit CNC control system that is extremely extensible and very powerful. Basically, if you’re building a normal, ordinary DIY 3D printer, a RAMPS or RAMBO will do. If you’re doing something weird, like a 3D printer with strange kinematics, a 5-axis milling machine, or you’d like awesome engraving on a laser cutter, Smoothie is the way to go. The stock board found in a K40 (left) and the Cohesion3D Mini (right). 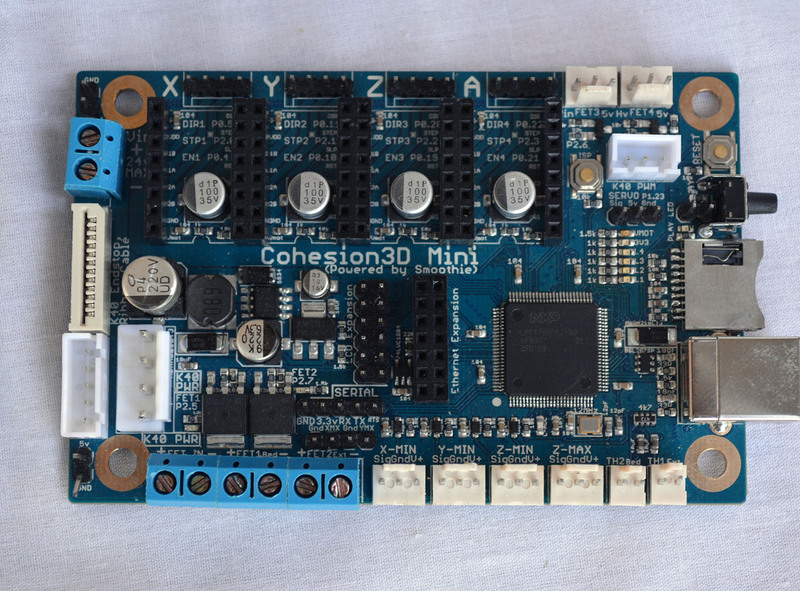 The Cohesion3D Mini is a drop-in replacement for the stock K40 board. The Cohesion3D board is a direct, drop-in replacement for the control board found in the K40 laser. Since all of the K40 laser cutters are the same, and they’re really only a power supply and a CNC gantry, this is the one-stop-shop of K40 upgrades. The terrible electronics are gone, you don’t have to use Corel, and for a hundred bucks, you have something resembling a professional laser cutter. The K40 laser has been around for several years now, but only recently have a few very interesting hacks and mods come out that push this blue light special laser cutter into semi-professional territory for people willing to get their hands dirty. A few months ago [Scorch] published K40 Whisperer, a piece of software that makes the stock electronics tolerable and able to accept normal SVGs and DXFs. The K40 has also been modified for a larger bed, and LaserWeb has been handling the software side of things for about two years now. Things are looking great for the K40 hacking scene, and Hackaday already has a, ‘I just bought a K40, now what?’ series in the works. Things are looking up for cheap laser cutters, and a Smoothie upgrade is just the cherry on top. We’ve had a love affair with the Monoprice Select Mini since it came out. The cheap printer has its flaws, though. One of them is that the controller is a bit opaque. On the one hand, it is impressive that it is a 32-bit board with an LCD. On the other hand, we have no way to modify it easily other than loading the ready-built binaries. Want to add bed leveling? Multiple fans? A second extruder and mixing head? Good luck, since the board doesn’t support any of those things. [mfink70] decided the controller had to go, so he upgraded his Mini with a Smoothie board. On the plus side, the Smoothie board is also a 32-bit board with plenty of power and expansion capability. On the downside, it costs about half as much as the printer does. Just replacing the board was only part of the battle. [mfink70] had to worry about the steppers, the end stops, and a few other odds and ends. For almost the last decade, desktop 3D printing has, at its heart, been centered around 8-bit microcontrollers. The ATmegas and other Atmel chips are good enough to move a few steppers and squirt some plastic. With faster processors, you get smoother acceleration, leading to better prints. Modern ARM devices have a lot of peripherals, allowing for onboard WiFi and Ethernet connectivity. The future is 32-bit print controllers. Right now there are a few 32-bit controllers, from the very weird, out-of-nowhere controller for the Monoprice Mini 3D printer to the more traditional SmoothieBoard. Only one of these boards has the open hardware cred for a proper 3D printer controller, and a this year’s Maker Faire, Cohesion3D introduced a few machine control boards built on top of Smoothie that add a few interesting features and techniques. 3D printers have forever changed the hardware hacker movement. From the original RepRap project on up through current commercial offerings, 3D printers have become an indispensable tool for hackers, makers, and engineers. While printers may not have started a desktop manufacturing revolution, they are a desktop prototyping evolution. It’s rare for a day to go by on Hackaday without a project that uses a 3D printed part in some way shape or form. These printers also continue to evolve, with new projects pushing the technology ever forward. This week’s Hacklet is all about some of the best 3D printer projects on Hackaday.io! If you want to see more 3D printer projects, check out our updated 3D printer list! If I didn’t wake up early enough to catch your project, don’t be shy, just drop me a message on Hackaday.io. That’s it for this week’s Hacklet. As always, see you next week. Same hack time, same hack channel, bringing you the best of Hackaday.io! Expensive laser cutters have a 3D engraving mode that varies the laser power as it is etching a design, to create a 3D effect. [Benjamin Alderson] figured this could be replicated on a cheap Chinese laser — so he made his own program called SmoothCarve. He’s got one of those extra cheap blue-box 40W CO2 lasers you can nab off eBay for around $600-$800, but he’s replaced the control board with a SmoothieBoard as an easy upgrade. He wrote the program in MatLab to analyze a grey scale image and then assign power levels to the different shades of grey. You can see the software and try it yourself over at his GitHub. The resulting application is pretty handy — watch it carve the Jolly RancherWrencher after the break!